Sarina's Sephardic Cuisine - Kosher Family Recipes - I'm a Fourth of July Cheat! I'm a Fourth of July Cheat! I posted about the Fourth of July on the beach, your backyard BBQ. Guess what, this year and for a few now, I have absolutely cheated. 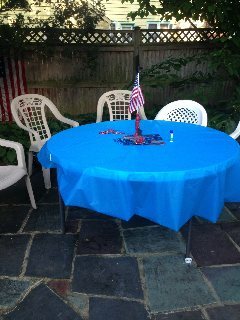 I spent the day at a backyard BBQ/Pool Party thrown annually by cousins Julie and Allen Barkin in NJ. Allen is the cook in his family and he loves creating magnificent BBQs. Julie on the other hand is the creative genius in the family. Allen always has excellent recipes. Appetizers included guacamole, babaghanouj, and grilled salmon. This year Allen grilled hot dogs, hamburgers, and chicken. Side dishes included (I may have forgotten one or 2) a bulghur salad, beans, corn, a toss salad with apples in it (how scrumptious!) and of course potato salad and coleslaw. Julie and Allen provide an abundance of fruit and their guests bring dessert (I brought a blueberry pie), which is generally eaten after the fireworks! Julie created simple functional and festive centerpieces made from candlesticks painted red. White chairs surrounded tables covered in red or blue clothes. 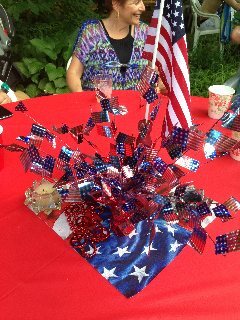 The candlesticks had flags in them and were surrounded by an assortment of flag decorations and New Orleans style fake beads. Very creative and very effective. So it’s true. I didn’t have my own BBQ this year. I totally cheated and enjoyed myself as a guest. I was able to relax and have a nice time in the pool with my grandchildren and talk to relatives and friends. BBQs are what you make of them. Julie and Allen were so organized that they spent a good part of the day enjoying their guests. I did not see them get flustered if things weren’t exactly right. The weather agreed with us all day and we had a wonderful time. Hope you did too!